If your schoolchildren home during the holidays are of an artistic bent, then I'd recommend bringing them for a morning or afternoon this week to the Butler Gallery in Kilkenny, writes Brian Byrne. There's an exhibition in the Gallery, in the basement of Kilkenny Castle, about 'The Breadwinner', the Oscar-nominated animated feature film produced by locally-based Cartoon Saloon. 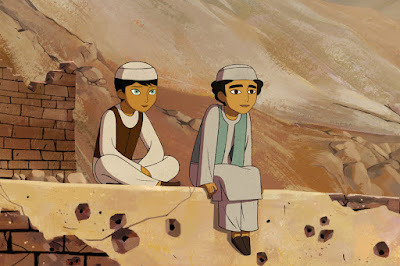 The three-room exhibition explains the background to the animated adaptation of the 2000 book of the same name by Deborah Ellis, about young girl living in Afghanistan under Taliban rule, who has to disguise herself as a boy in order to be able to work to help feed her family. The displays not only provide a very easy to understand explanation of the techniques of producing animated films with modern technology, but also give an excellent backgrounder to Afghanistan and the disruption to normal life which the Taliban inflicted on people who are, well, just like you and me and our children and grandchildren. And there's an interactive element on Tuesday, Thursday and Saturday afternoons with an artist-in-residence, where visiting youngsters can try their hand at elements of building storyboards and character and location designs. The exhibition is free. But it ends next Sunday. Since it opened in May, more than 18,000 have visited.